The Cobbs Auctioneers is a professional family-owned and operated auction house located in the historic Mill building known as Noone Falls Mill, in the quaint New England town of Peterborough NH. One of our primary missions is to provide a transparent and enjoyable auction experience for both buyers and sellers. We take extra measures to both expose our consignors offerings to an international market and give our buyer customers the confidence to participate and make purchases, in an auction setting. We share a love of art, culture and history with our customers and know that honesty and disclosure are crucial elements for successful transactions at auction. We strive to instill and promote a sense of stewardship and passion for art, antiques and cultural objects. Like many of our customers we share a belief that objects have meaning and value above and beyond their investment, but we do not take that investment for granted. We specialize in 19th century or earlier Americana and Fine Art though our auctions cover a wide range of approximately 50 major collecting categories. We are fully licensed and bonded as an Auctioneer in the state of New Hampshire and on a cooperative basis in other states. One of the benefits of operating in NH is that the state does not have a sales tax which translates to more money for our consigners and less expense for our buyers. We are partnered with Invaluable and Auctionzip for the convenience of our customers who prefer to bid online. 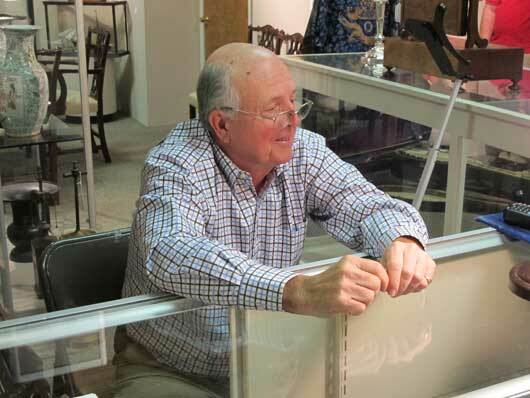 Originally an Antique Business, The Cobbs Antiques was established in 1967 in Ridgewood, N.J. by Charlie and Dudley Cobb. In addition to a passion for antiques the Cobbs had a passion for historic properties and operated the Antique Business from the circa 1760 Peter Hopper House that they both saved and restored. In 1974 The Cobbs moved to Hancock NH to another historic property, a circa 1790 cape with a dining room painted by the famous itinerate artist and inventor Rufus Porter. Their dining room was with their permission recreated for the Rufus Porter museum as one of the best intact examples of his work to have survived. Preserving and restoring this home in addition to growing the antique business became their full time work. In 1980 the Cobbs purchased 76 Grove Street in downtown Peterborough NH to house their growing Business and while at this location began holding Auctions. 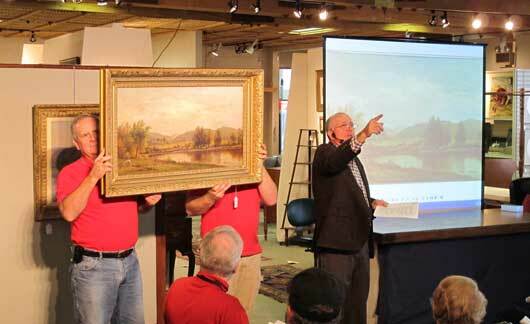 In 1987 they formally became the Cobbs Auctioneers and where joined a few years later by their son Bruce Cobb. The Cobbs purchased their 3rd historic and largest building (Noone Falls Mill) in 1998 to move the auction business. Noone Falls has the distinction and space required for further expansion of the business. By 1999 the Cobbs were strictly conducting Auctions and no longer buying or selling antiques which they saw as a conflict of interest. The Auction house is owned and operated by the founders/partners as well as numerous extended family members and dedicated employees.